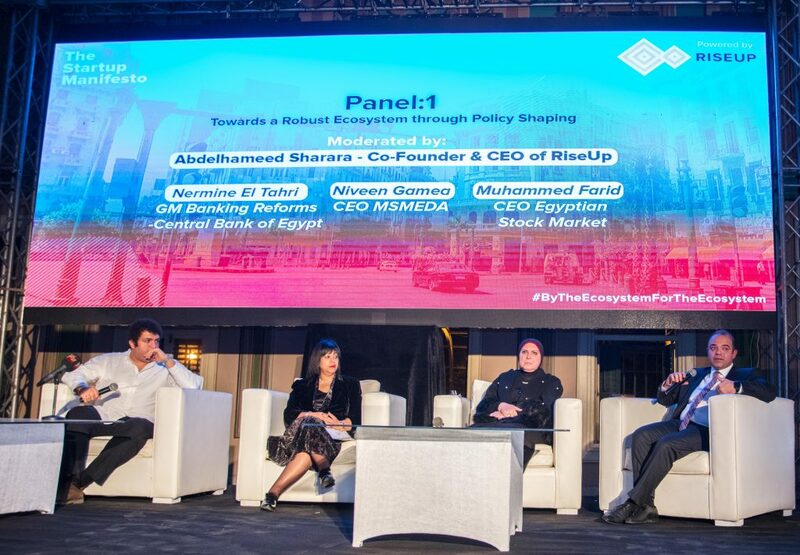 The initiative spearheaded by RiseUp, an annual summit tackles the most pressing issues affecting entrepreneurship ecosystem in Egypt; from access to data, access to funding, talent brain drain out of Egypt, investment opportunities and policies and regulatory requirements. The manifesto was prepared alongside 200 stakeholders with expertise in venture capital, building companies, legal frameworks, public policy, education, talent management, accelerators, incubators and many more, who met and collaborated over the past 12 months, to contribute to the Manifesto. The opening panel, entitled “Towards a Robust Start-Up Ecosystem through Policy Shaping” saw bigwigs, leading business executives and policymakers discuss legal and regulatory challenges for startups. Nermine EL Tahri, General Manager of Banking Reforms at the Central Bank of Egypt who was a panelist at the opening sessions explained why the Central Bank of Egypt established a risk fund with a credit guarantee company, to reassure the banks that this sector is thriving because of non-repayment of loans. 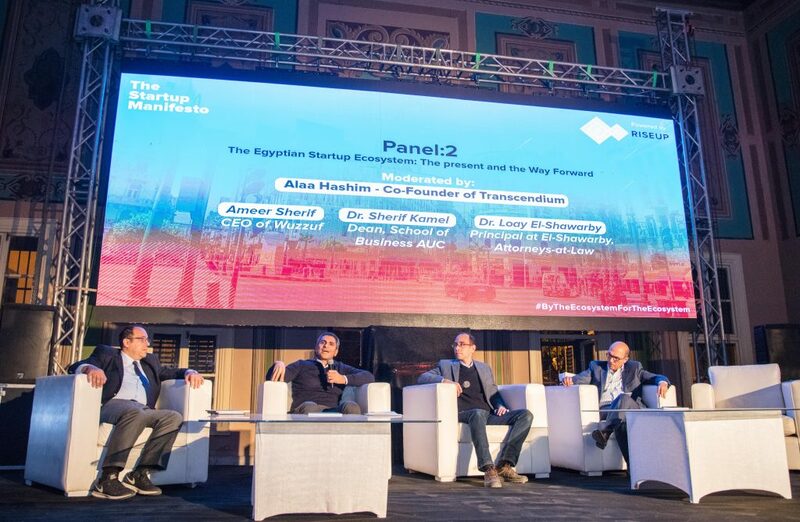 The second panel, entitled “The Egyptian Startup Ecosystem: The present and the Way Forward Panel” featured Ameer Sherif, CEO of Wuzzuf, Alaa Hashem, Co-Founder of Transcendium, Dr. Sherif Kamel, Dean, School of Business the American University of Cairo, and Louay El Shawarby, founder and principal at El Shawarby Attorneys at Law. The final session saw players in global ecosystems take the stage to discuss “Global Perspectives on Ecosystem Development”. 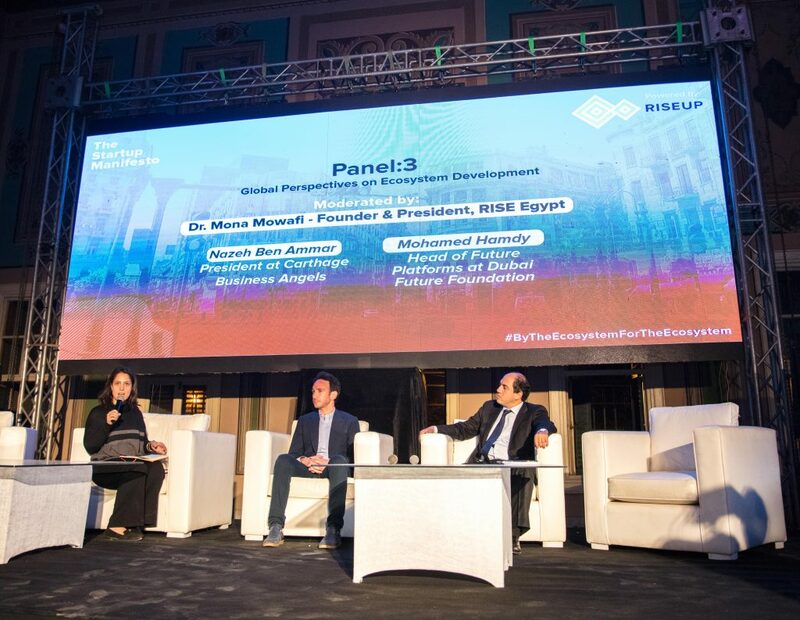 Mona Mowafi, founder of RISE Egypt, Nazeh Ben Ammar President of Carthage Business Angels and contributor to the Tunisian Startup Act and Muhammed Hamdy, Head of Future Platforms at Dubai Future Foundation were among the panelists at the session.